Clever social campaigns, analytics and engagement tools for companies that blog. Missinglettr turns each of your blog posts into a 12 month social campaign, which is then dripped out to your social channels. Each campaign is designed to engage with your audience and drive traffic back to your site. Missinglettr creates a whole sequence of social content and branded imagery (fully cropped and optimised for each of your social accounts). Simply review and edit if needed. Update the templates used to create your campaign content to reflect your local language or writing style. Need shorter / longer campaigns? Create your own schedules based on duration & post frequency. Compliment your social campaigns by having Missinglettr re-publish your blog posts on Medium. Optionally choose to have your campaigns reviewed by clients or anyone else you want to invite. Shorten your campaign URL's with goo.gl, bit.ly, PixelMe, replug or Short.CM. With more on the way! Customise your campaign images. Take control of your social brand presence and really stand out. Download the campaign images we generate, so that they can be used in other marketing initiatives. 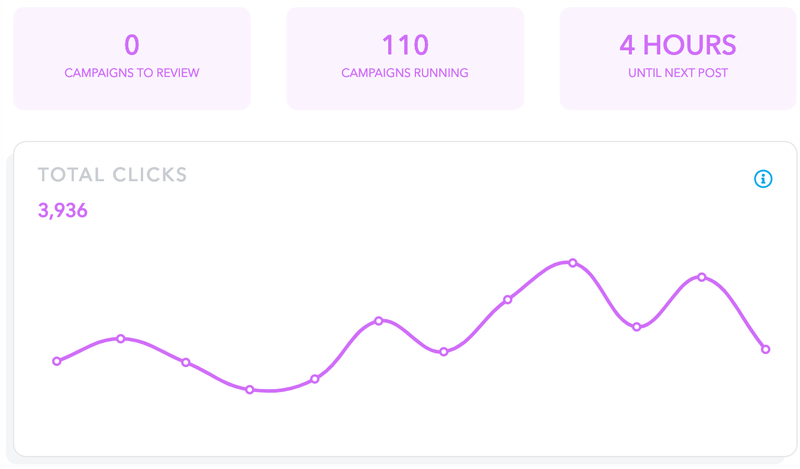 Track the number of clicks your campaigns are generating. We help you keep on top of your game. Publish evergreen blog posts but don't create drip campaigns for each of them? Then your posts are only getting a fraction of the attention they deserve. Missinglettr creates a years worth of social content and drips them out gradually over the year, so you don't have to! Get a seat on our webinar and learn how to market your blog posts like a pro and setup a Missinglettr campaign in minutes. Trusted by thousands of individuals, companies and brands. I love seeing the tweets from my blog posts turning up with no effort on my part! This is such a cool service. Missinglettr has been a pivotal part of our social strategy. I do not know how we would have coped so effectively without it. Love using MissingLettr! Makes sharing blog posts so much easier and more efficient. It's so easy to set up a drip feed campaign with really engaging and visual Tweets. It's pretty fantastic if you ask me! Missinglettr saves us several hours a week & ensures we consistently share engaging posts with our growing follower base. 3 important things for business owners are Time, Money & Value. This is an exciting new tool that delivers on all three. Not only does Missinglettr save time, but we are getting a higher percentage of retweets & favourites. I did not expect much, but this is the real deal. They are making up better follow-up tweets than I do! Great results!